I have found that massage can have a positive effect on all of these. 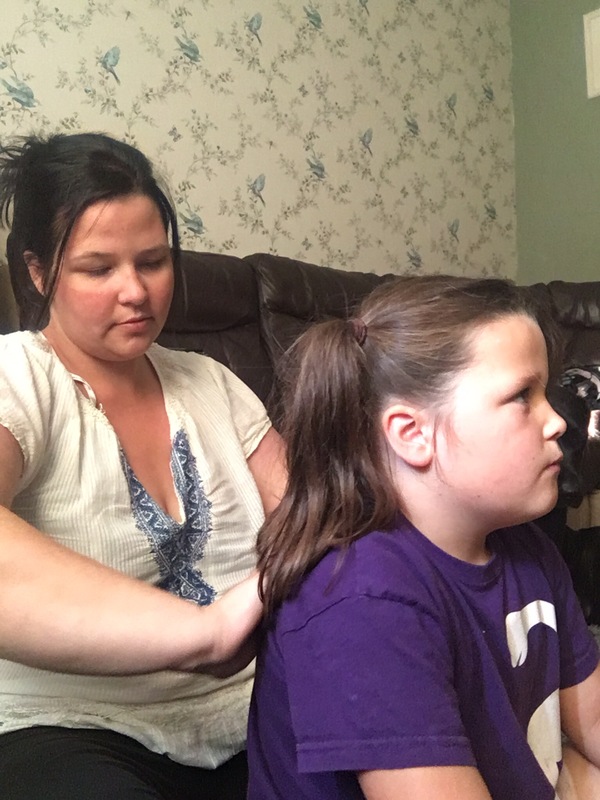 Its not just my view point either there are so many articles on the use of massage with disabilities and special needs its a wonder that massage is not more widely available and obtainable by parents. 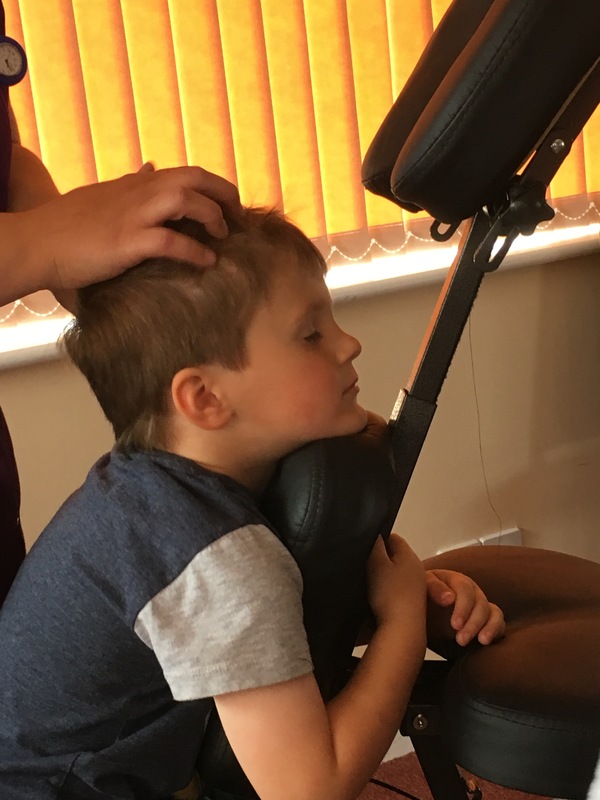 Massage for us has been a life line, a way for all of our children to relax, de-stress and benefit from the healing power of massage as well. Its not just the disabled child that could benefit but sibling’s, parent’s, wider family member’s. Have you ever been for a massage? For many of us through time and money restraints massage may not be possible, it was only ever a luxury I had had a few times since having children. You don’t need to go out and spend money though even just sitting with your children giving them a cuddle, playing with their hair can be just as relaxing. We bond through touch, we communicate and we reassurance with touch and we can soothe and relax through touch. 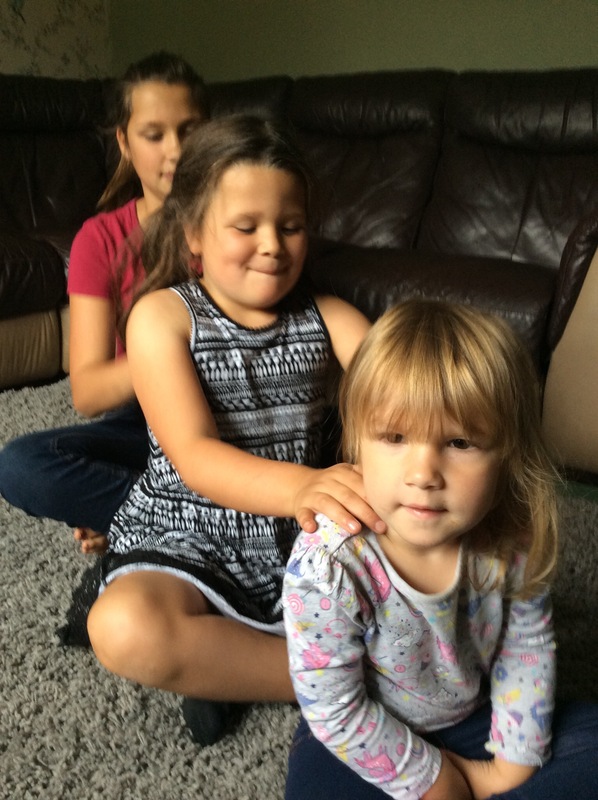 I initially trained in Indian head massage as a way to help my own children. From there it has grown into a passion due to the benefits I have seen within my own family and its these benefits I hope to pass onto other children and parent’s. 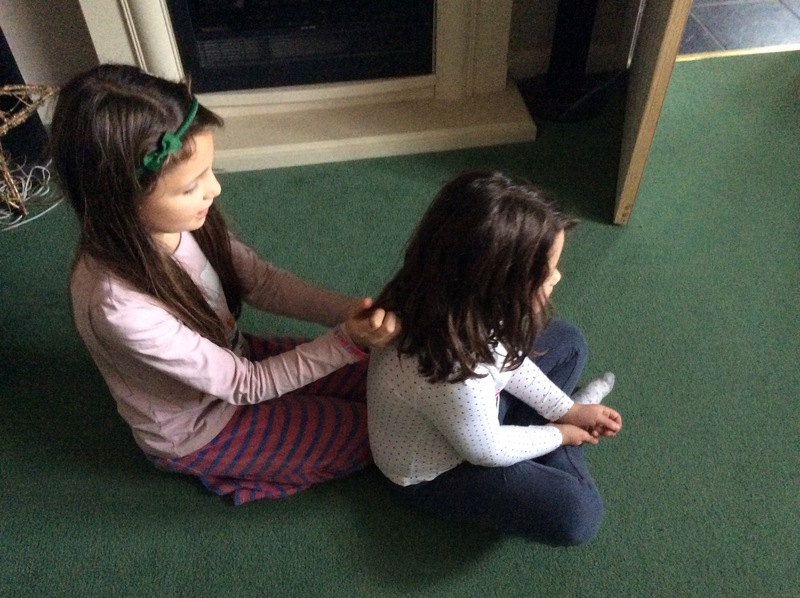 This massage skill is an amazing activity to add to your family life. Story massage is simply 10 massage moves which you use against the backdrop of any nursery rhyme, story, poem, song. The list is endless and I have hours of fun making up my own stories for my children to enjoy. The best thing about story massage is that it is a skill the whole family can learn and enjoy together and it can last 5 minutes or 20 minutes. There are some days when I feel at my worst and I don’t understand why my daughter has ADD, or why she suffers with anxiety or even why my children were born with a hearing loss so how can I expect my other children to understand? I have talked previously about the often turbulent and volatile relationship between siblings when one has ADD but after a week now of daily tip tapping, swearing and screaming I feel like I am at my wits end. My ADD daughter is the third of four children. All girls!! I will not say it’s an easy task raising girls but I try to do my best. What I mostly struggle with is the relationship my daughter has with her sisters. 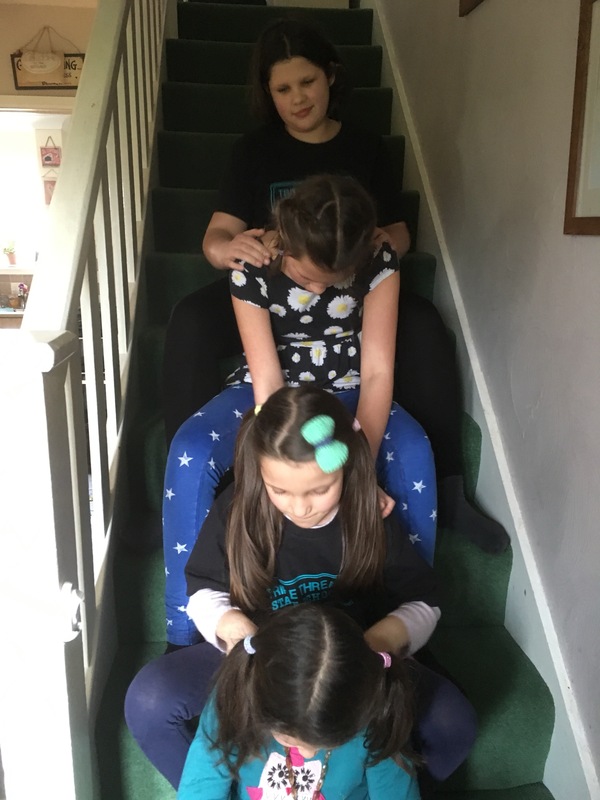 Some days I blame myself and find it hard to come to terms with the idea that my children have difficulties and other days I manage to brush myself down and get on with parenting but my other daughters find it hard to process their sisters behaviour and they can not understand why (L) is the way she is. It’s on these darker days that the behaviour and symptoms of ADD become more apparent especially before the medication starts to work. For two hours before school there is arguing,shouting, screaming, objects flying and general put your hands over your ears din. Some mornings I do not even want to get out of bed. With three children trying to get ready for school and one who is being disruptive, its mayhem and can resemble a battle field…..Yes girls can fight like cats and dogs and its not a pretty sight!!! I feel so emotionally shattered by the time my children walk into school other parents must wonder what a miserable women I am! The older the kids get, the harder it’s becoming to be a mum. Its harder to contain arguments, disagreements and fighting especially when two of your daughters are the same height as you…There is also no negotiating with a child who neither understands, remembers or processes what you say. 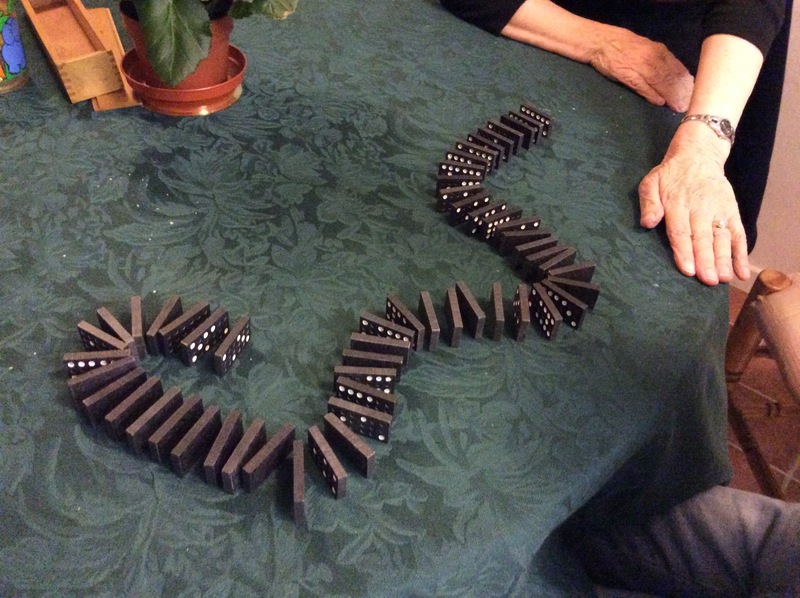 My ADD daughter finds it increasingly difficult to navigate the sibling situation. She is either going of the deep end at them, annoying them or being mean to them or she gets upset because they don’t want to play with her. I can’t blame them (L) may have forgotten that book she threw at them this morning or the slap she gave them but my other three do not forget and they don’t seem to forgive either. Some days I do all I can to limit the stress caused by them. I have to split them up, give them different directions!! I often feel like I am waving my arms around like an Orchestra Conductor. Give all of your children at least 15 minutes in an evening by themselves either talk about their day or do some reading. I have found this makes them feel important its not easy as you may get interrupted but persevere. cooking….I try to involve the older ones in cooking for everyone. It gets them out of the firing line for a while and makes them feel involved. 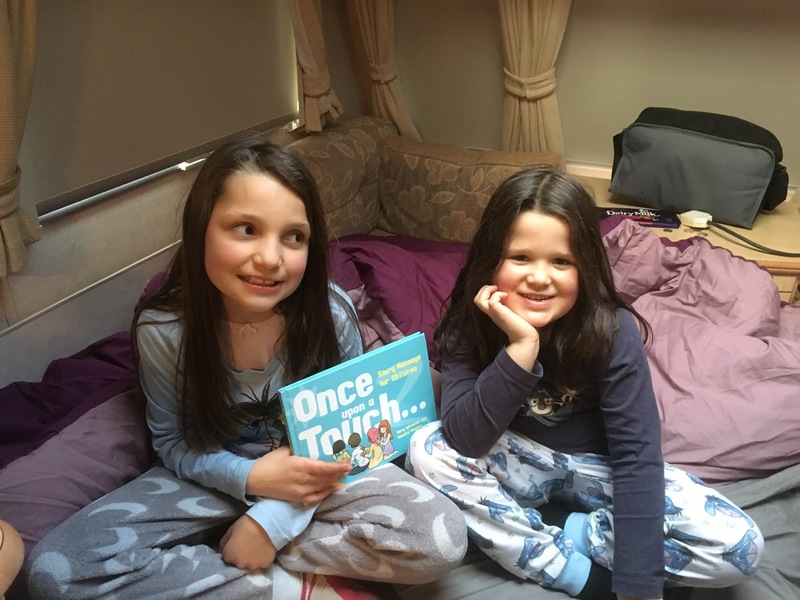 sleep overs / days out…for the siblings of a child with ADD/ADHD family life can be hard for them. If at all possible arrange a day out or a sleepover for them with friends or family. It will give them time out and an escape especially if its been a stressful week. Find an activity that everyone can enjoy. We use Story Massage a lot in our house for almost every situation. Story massage promotes relaxation, fun, concentration and it can also calm and bring everybody together. Go for a walk. I find even just going around the block can clear the air and relieve some excess energy. As a parent of a child with sensory and learning difficulties I am always on the look out for new and exciting play ideas. Being a parent and entertaining children of all ages can become difficult and stressful. Add in the special needs of ADD, Anxiety, Hearing loss and playtime can produce tantrums and tears born of frustration and lack of understanding. I sit and wonder some days what it must feel like when you think everything and everyone is against you and you don’t understand what you are suppose to be doing. Playtime is such an important part of a child’s life and education. Its how they learn from an early age about the world around them. So how do our children do it? In my opinion its because they are amazing!!! These little individuals adapt to work around their disabilities. All children can feel frustration, anger, upset, possessiveness while playing and socialising. I have found as a parent though especially at home that these feelings associated with ADD / ADHD are heightened. Add in impulsiveness, an inability to wait their turn and short term memory loss, for us finding play ideas is always a challenge. While my daughter is 10 years old her level of understanding is impaired. She thinks differently. Harnessing my daughters strengths and interests is an important part of my roll as a parent and using these ideas can materialise into a myriad of play ideas and situations. We adapt what we have and make the best of it. Sandpits….A really good wealth of play activities from seeking treasure, building sandcastles, writing, drawing, making shapes can all be achieved in a sandpit. 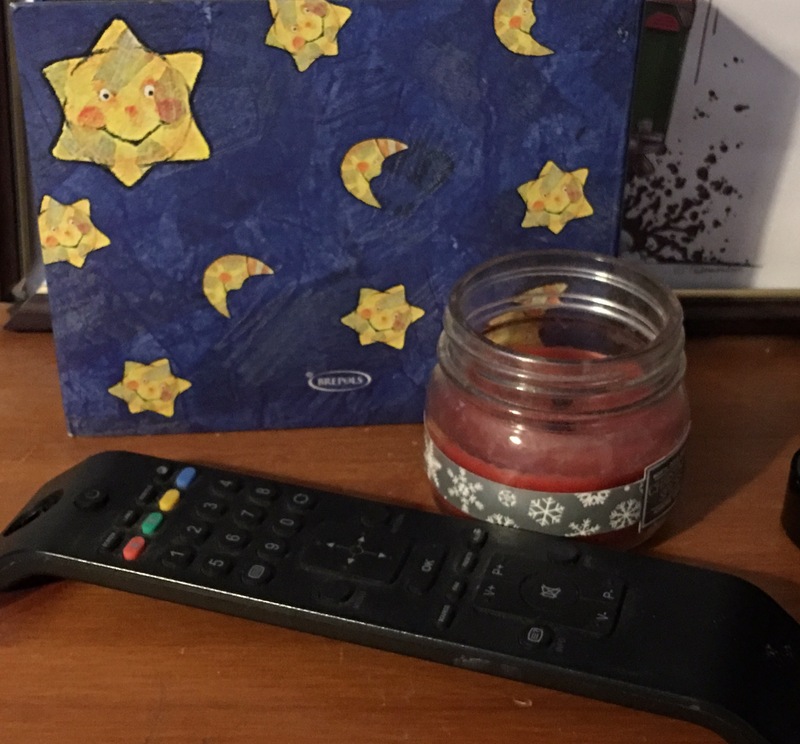 Arts & Crafts….We buy bargain’s from pound land or other similar shops and set up on the dining table or even outside. In the autumn we go for walks and make leafy collages from items she has picked up. Role Play…we have a lot of role play toys from food items, dressing up clothes, dolls and teddies. For those of you with boys yes they can dress up and play along as well. My nephews love pushing pushchairs around. The great thing about role play is you can adapt it and you can play with them. Dens….This is one I loved to do with my siblings when we were younger. Seek out an ideal place and put up sheets, quilts, blankets to make an amazing den. My girls will play in their dens for hours playing house. With regards to play there are some things I have found its just easier to avoid. Puzzles and board games, these cause the most amounts of headaches, tears and tantrums. my daughter just can not cope with them. They cause anxiety and frustration. They can be thrown around in anger causing them to be launched at me or siblings (trust me having a hand full of little monopoly pieces flying at you is not funny). I just do not find the appeal anymore. Saying that a deck of cards is great for a round of snap!!! We got together at Pennies house and had a great morning playing with coloured spaghetti and food play items, foamy bubbles, and the Crunchy box. This last idea had to be my favourite. 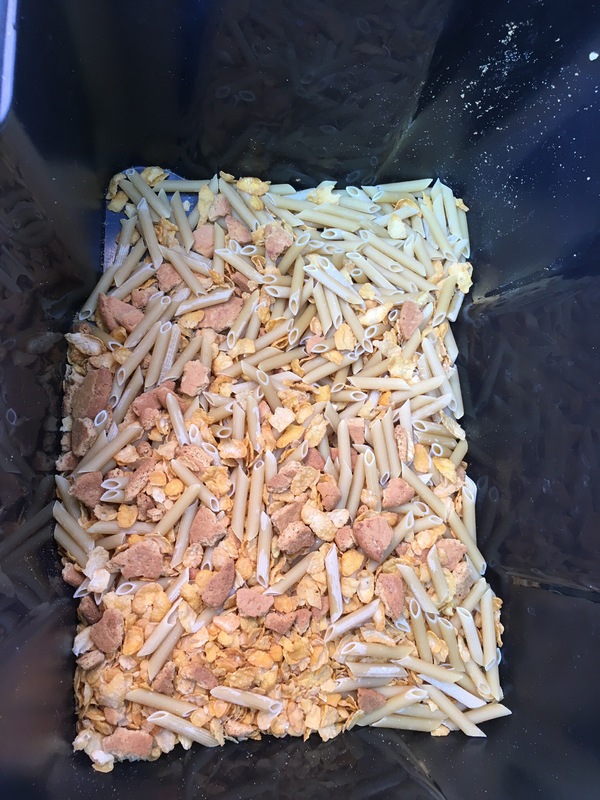 All it is just a plastic box filled with dried pasta, biscuits, cornflakes all mixed up. 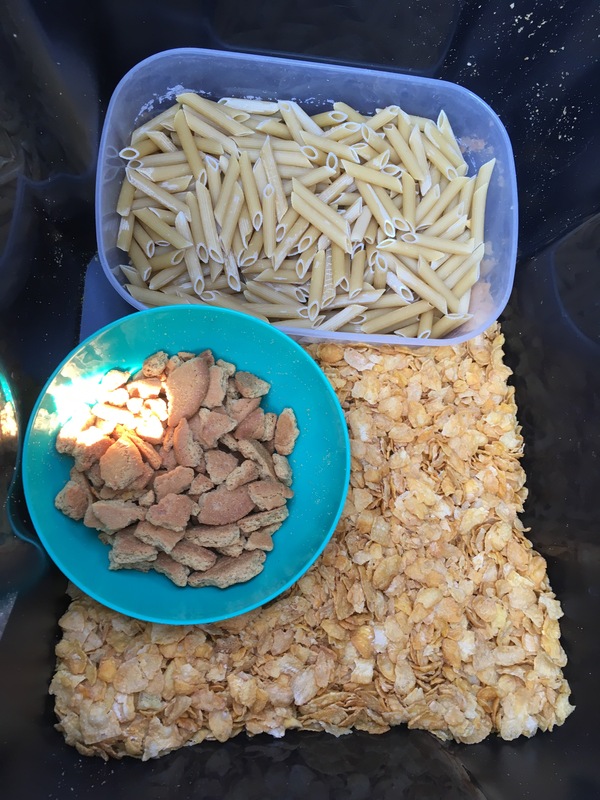 Pennie says “This is good for concentration, fine motor skills,distance judging, edible and its also great for touch,feel and sound and works with all ages.” My daughters spent ages separating all the ingredients into three separate piles. It took them ages and lots of concentration but it cost next to nothing and kept them entertained for a good couple of hours.